Saturday started with a Tex-Mex hangover cure at Maudie's (um, YUM!) & continued with shopping along South Congress (so many shops!) & a tour of the city's murals (OB.SESSED). I could have stayed all day in Uncommon Objects (couldn't take pictures inside, dagnabit! ), but couldn't complain that we moved on to refresh with margaritas and music at the Guero's Taco Bar outdoor concert area. I might have also drank lemonade while dressed as a lemon (@ Austin City Lemons) & then topped it off with Amy's Ice Cream (again, YUM!). We tracked down the Austin postcard mural & the Bread + Butter mural & then moseyed back home for some girl time. My ladies threw me a sweet (& sassy!) lingerie shower & tossed in a total surprise too. They had video-taped Tyler answering questions about me & I had to try to answer them, Newlywed Game style! I learned some things (AKA he hates this vest) & laughed a lot! We went all out for dinner, sushi at Uchiko. Let me just say, go straight for the 10 course chef's tasting menu… you will spend $80 a person either way (YOLO right?). After such a classy dinner, the only option was going down to East 6th Street to get our dirty on with the masses. Let's just say there was a time when I was dancing on a bar with a champagne bottle… & it was awesome! Oh & at the end of the night we couldn't find a cab, so we rode home in an old school (80s?) white stretch limo… yup, that happened! Sunday morning I sprung out of bed, excited to meet my long time blogger bud, Shanna. We got to finally hug each other's necks, chat face to face & do what bloggers do best - take pictures. Shanna was so sweet to navigate me out to East Austin (hipster-ville) to meet up with my gals for brunch at Yellow Jacket Social Club. This place is definitely a diamond in the rough - great ambience & I would drive back to Austin this second to have "The Mister" breakfast panini again. None of us wanted to say good-bye to Austin quite yet, so we headed to Kung Fu for one last round (or 3) of mimosas & sucked at giant Jenga (it was HARD y'all!). do you Kung Fu? // mimosas + Instax pictures // ending the weekend with Pickle shots! And then my honey picked me up from the airport with red roses (awww, I got a good one!) Whew, so that was my weekend. And now my old lady body is paying for it, but I don't regret a thing! Only 18 days till we say I DO!!! looks like you had an amazing time! what fantastic friends! This trip sounds like a dream! I am so glad that you had such a good time with your ladies! 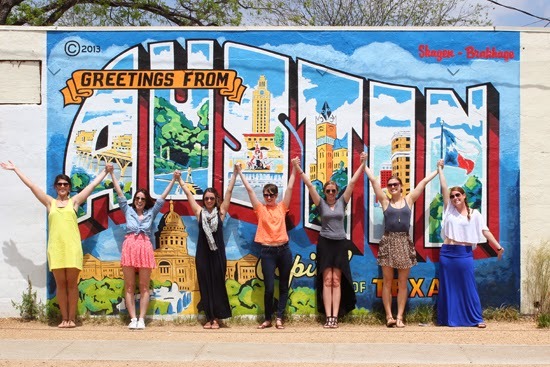 I am so in love with that picture of all of us in front of the Austin mural. LOVED getting to celebrate with you! sounds like the perfect weekend!! that photo of you dressed up like a lemon is hilarious! haha! Looks like you had a ton of fun!! Oh my gosh, I need to see about four thousand more pictures of you in that lemon costume - hilarious!! Austin sounds like so much fun. Austin looks so fun! I recently made the decision to relocate to Texas (Dallas) and now I'm kind of sad I didn't visit Austin and give it much consideration. I hear it's gorgeous! It looks and sounds like a wonderful weekend. soo fun I LOVE austin!! Sounds and looks like you girls had a blast! I'm so glad. My bachelorette was (and 6 years later still is) the best weekend I've ever had in my life. That picture of you in the lemon costume is HILARIOUS! And I just love the one of you and your girls in front of the Austin sign. Aww, this is totally making me nostalgic for all my wedding festivities. Can't wait to "see" you get married girl! Uchiko is A-MAZ-ING! I could have died and went straight to heaven after eating there!! This post makes me want to go back to Austin ASAP! I'm pretty sure you have been to more places in Austin than I have, and I live here:) You've given me tons of ideas for when people come to visit though!